Interview with Neil Rosenberg in “The Osborne Brothers,” Bluegrass Unlimited, September, 1971. Sonny Osborne was born in the coalfields of eastern Kentucky. Like so many others from that region, the family migrated to industrial areas in the early 1940s, winding up in Dayton, Ohio. His father, Robert Osborne, Sr., blended a job at NCR Corporation with part-time farming. He loved country music and transmitted that love to three children: Bobby, Louise, and Sonny. By 1949 Bobby was a professional musician, performing with the Lonesome Pine Fiddlers in West Virginia. In the sixth grade, Sonny became interested in the banjo and convinced his father to purchase an inexpensive starter instrument. Before it arrived, Sonny visualized how to play two pieces, the Stanley Brothers’ “We’ll Be Sweethearts in Heaven” and “Cripple Creek.” He surprised himself and his family by playing them the day the package arrived. As he later described in the autobiographical “Me and My Old Banjo,” Sonny became obsessed, practicing eight to 15 hours a day until he felt ready to perform in public. Ott Ginter, a neighbor, took the banjo prodigy to the WPFB Jamboree in nearby Middletown, Ohio, and released four home recordings on the Kitty label under the name “Lou and Sonny Osborne.” These included Louise’s composition, “New Freedom Bell.” Also performing were brother Bobby and Jimmy Martin, who had joined the Lonesome Pine Fiddlers in 1951. The next school year was tumultuous for Sonny. Bobby was fighting in Korea with the Marines. The family moved from the farm back to Dayton, where Sonny met Judy, the girl from across the street who later became his wife. He recorded three sessions under his own name for the Gateway label in Cincinnati, including “Sunny Mountain Breakdown,” which sold some 67,000 copies. And when Bill Monroe came through Toledo in need of a banjo player, Sonny left school to pursue music full-time. When Bobby left the military, the brothers first played together in Knoxville, Tennessee, on November 6, 1953. Unable at first to sustain an act on their own, Sonny and Bobby teamed with Jimmy Martin for a year, Charlie Bailey for a few months, and Red Allen from early 1956 to mid-1958. During this period, they gained valuable performing and business experience, radio and television exposure, and recorded for nationally distributed labels RCA and MGM. Sonny became famous as a cutting-edge banjo player and harmony singer, but the Osborne Brothers’ ace in the hole was Bobby’s stunningly high and clear voice. Devotedly loyal to his elder brother, Sonny worked tirelessly to build the act as a commercially viable package. Interested in a wide variety of music, it was Sonny who brought to their sound elements of rock ‘n roll, rhythm and blues, modern country, pop, folk, and jazz. As each Osborne Brothers record was released, banjo fans would delight in discovering the new licks Sonny had adapted from horn, keyboard, lead and steel guitar, and even percussion players. Sonny was also principal architect of some of the most complex and effective trio vocal arrangements ever recorded in bluegrass or country music. In 1963, after a decade of effort to carve a niche in the music business, the brothers were still driving and maintaining taxicabs in Dayton to make ends meet. Sonny found Doyle Wilburn’s business card and called him from a motel in Chester, Pennsylvania. Within days, Wilburn had arranged a guest spot on the Grand Ole Opry. In the next year, under the tutelage of the Wilburn Brothers, the Osborne Brothers had a contract with Decca, a permanent berth on the Opry, radio airplay, a publishing contract, and bookings in more upscale settings. Some of the Osborne Brothers’ most popular songs as country/bluegrass artists included “Ruby Are You Mad,” “Once More,” “Rocky Top,” “Making Plans,” “Up This Hill and Down,” “Midnight Flyer,” “Muddy Bottom,” “Tennessee Hound Dog,” “Georgia Pineywoods,” and “I Can Hear Kentucky Calling Me.” They played major country package shows and bluegrass festivals, bringing to both the same brand of high-powered, crowd-pleasing entertainment: Sonny’s banjo, Bobby’s mandolin, perfect vocal harmony and — for a time — amplified instruments, electric bass, and drums. A changing country marketplace and the brothers’ lifelong preference for bluegrass brought them back to an all-acoustic act by the 1990s. Audiences at festivals and concert appearances welcomed the traditional sounds. A string of Osborne Brothers albums for niche labels CMH, Sugar Hill, and Pinecastle exposed primal bluegrass to those who weren’t alive for the classic bands of the ‘40s and early ‘50s. Sonny and Bob continued to attract young and talented disciples, eager to apprentice on touring appearances and recording sessions with the well-known masters. Sonny Osborne found a side career in producing recording sessions for emerging artists, including the Pinnacle Boys, the Virginia Squires, Terry Eldredge, and Dale Ann Bradley. 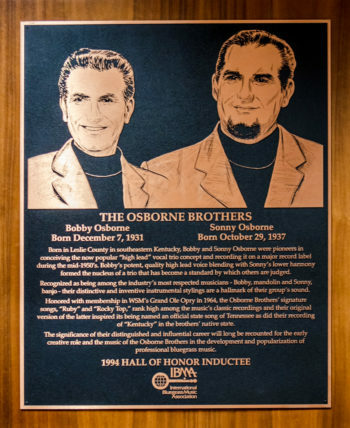 A half-century musical partnership between the brothers came to an end when Sonny Osborne’s rotator cuff surgery forced him to stop playing the banjo and leave the road in 2004. Sonny remains active in musical affairs, distributing a line of banjos branded with his nickname, “Chief.” Always outspoken, Sonny continues to advocate for high standards in bluegrass and respect for the founding pioneers, who struggled with little reward to create an art form and industry with worldwide impact. An endlessly innovative instrumentalist, Sonny was the first to popularize double banjos, the six-string banjo, and instruments combining various elements of the banjo, Spanish and resonator guitars. Helped to introduce the high-lead vocal trio (Sonny sang baritone, the second-highest part) and complex vocal arrangements that echoed pedal steel guitar harmonies. An active member of the International Bluegrass Music Association from the beginning, spearheaded the idea of a Bluegrass Trust Fund to help members of the bluegrass community in emergency need. Guested on recordings with Carl Smith, Charlie Pride, Conway Twitty, Wade Ray and Jethro Burns, Gary Burton, Mac Wiseman, and the GrooveGrass Boyz. Shortly after a zealot cut the chord of his amplified banjo the first time he played it at a bluegrass festival, Sonny padlocked the resonator and refused to disclose his electronic solution for preserving its quality tone. The Osborne Brothers’ hit “Rocky Top,” named a Tennessee State song in 1984, is played every time the University of Tennessee Vols score a touchdown. Catalyst for recognizing the Pioneers of Bluegrass (pre-1954 professional performers) at the International Bluegrass Music Museum. A section of Route 421 in Kentucky was named “Osborne Brothers Way” in 2000. Quoted by Glenna H. Fisher in “The Osborne Brothers,” Bluegrass Unlimited, July, 1984. Letter to the editor, Bluegrass Unlimited, June, 1967. Interview with Eddie Stubbs, quoted by Marty Godbey in liner notes to “The Osborne Brothers: Decca/MCA Recordings, 1968-1974,” Bear Family Records, 1995.